So way back when, we all thought Maxwell was going to be the answer and the end all be all for renderings. The visuals were promising, but the workflow was painful, and always felt like it broke my production process. They had a plugin for SketchUp and for 3dsmax. Both versions required Maxwell's own 3rd party software rendering program, and so it wasn't really rendering within the software of choise. Vray for SU never really worked right either. Adjusting materials were cumbersome, but it just didn't like some large scenes built in SU. So I continued to stick with my tried and true workflow: model and texture in SU, import into 3dsmax, add lights, tweak materials and render. Well perhaps Maxwell has learned from its past, because they just released a brand new plugin for SU. It's so streamlined into the software, infact there isn't even an install. Just a maxwell.rb file with a folder that gets placed in the plugin folders and that's it. If that wasn't good enough, they provide it for free, which allows you to render up to 800px. Now if you want to render larger images, the licensed version is nothing to kill your wallet at $95! The icons are very simple aside from the buttons that give you scene stats, take you to Maxwell's website for documentation, and the help button, there are very few options. The Fire button simply opens the render frame buffer window up. When you hit the fire button, it bakes everything from your scene so that it can render. This sounds painful, but it really isn't. For large SU files the longest it took was a mind blowing 30 seconds. At that point the frame buffer window becomes a realtime render window much like VR-Realtime. The pencil icon in the middle opens your settings window. The eyedropper icon selects your materials. The disc looking icon and the f.d. ruler select your DOF, and make choosing it very easy. The settings that really sold this to me were the materials. They are so simple, and they are almost a seamless 1:1 with what you have already created in SU. So if you tweak a material in SU it gets tweaked in Maxwells material browser. So Maxwell just has the same materials that you already created, with some extra settings. You can change the materials reflection type to tell it to render as metal, lacquer, velvet, light emitting, satin, etc. But what is really clever is that MW automatically creates a grey-scale bump map for your texture map....do I hear a "sweet". It gives you options to invert. What is even cooler is if you change the brightness or color on the map in the MW settings, it changes them in your SU material settings too. Of course if you really want to get fancy, you can unlink the MW texture from SU, but it's just a toggle and you can always turn it back on at any time! The camera settings are what you would think they are. There are parameters to specifiy the render size. Then there are the camera settings themselves. 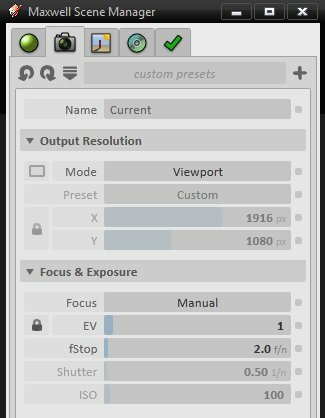 Much like mental ray in 3dsmax, you can specify your fstop, shutter and ISO, or just your EV value. The cool thing here is that changing your fstop affects your amount of DOF just like a real camera. Also you can choose if you want the focus to work manually, or semi-automatic, or totally automatic, based on the scene objects and distances. 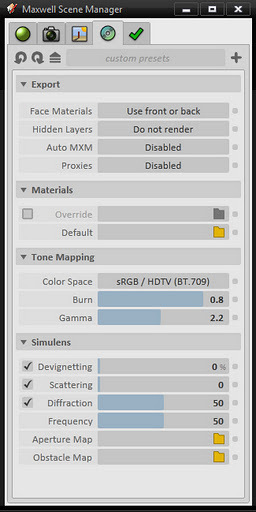 The next settings are the environment or lighting settings. The first option is to choose your type of skylight. You can use the default sky dome, the physical sky (which is linked to your sun angle from SU), or a simple hdr map of your choice. Then you have the option to turn the sun on or off along with other atmosphere settings like turbidity, ozone, etc. Then, much like vray, you can toggle a ground plane on and off as well. The last settings I'm going to cover are some custom settings. You can tell MW to use just front or both front and back faced materials. Also how it will respect hidden layers. There is also a material override option for simple testing. Then there is a section for color management. you can tell it to use sRGB, or the myriad of color options. The burn tells MW what to do with highlights, and then there is gamma. The last section, simulens, I haven't played with yet, but have a hunch that it's really cool. I'm guessing devignetting is simply vignetting in your rendering. There are options to add aperture maps, which i'm guessing control the way DOF creates its bokeh effect. But these are all photo-phenomenon tools that will add realism to the rendering. That's pretty much it. I was really amazed at how simple and robust the UI was. I'm not sure if its because my computer is any faster but I could guess that the rendering algorithm is faster at computing the data. 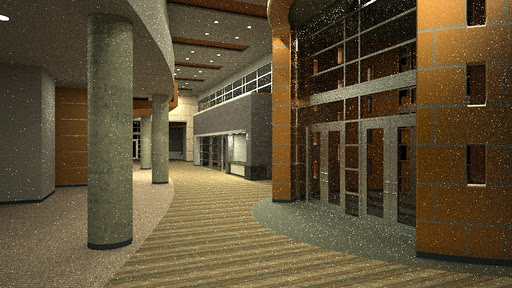 It seemed that my renders were going quite quick, and gives iray a run for its money. Where some of my scenes wouldn't fit into memory for iray in 3dsmax, maxwell in SU was able to handle them fine. I have a feeling it has to do with SU's small memory footprint, then again, there may be some wizardry coming from the Spaniards! UPDATE (2012-02-02): So just recently downloaded the latest Maxwell for SU, and they did make some revisions in their software. Unfortunately the software now requires an .exe install, and is a little larger, but hopefully that will only make it faster. Also it now requires Microsoft Silverlight, but that's not so bad. The max. resolution even for the license version is limited to 1920 pixels. I usually work at a min. of 3200x2400. Guess I'll stick with max/ MR for now. You're right, you can only render up to 1920...my bread and butter is still max/mr as you said, but this gives a nice alternative for certain tasks. Have you tried positioning your textures from sketchup?, whenever i try rotating a texture on the model, it never makes the change on the final render.Besides that it seems to be a better integrated renderer than vray for sketchup...or maybe i am wrong?